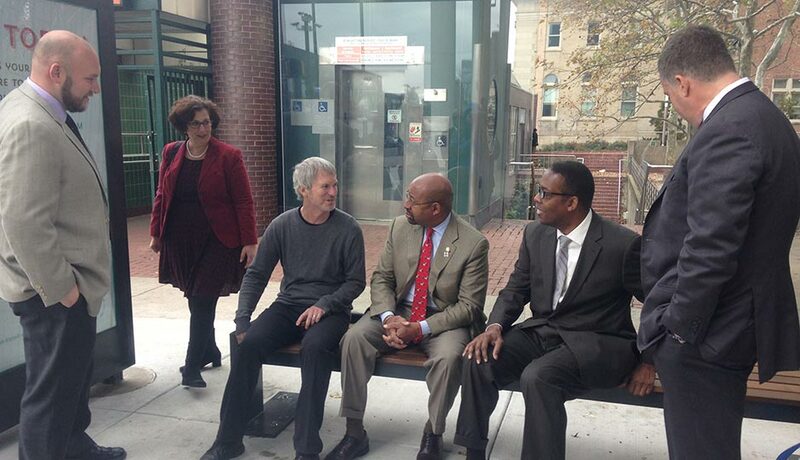 Mayor Michael Nutter, City Council President Darrell Clarke, SEPTA general manager Jeff Knueppel and Mayor’s Office of Transportation and Utilities director Denise Goren all gathered at the northeast corner of Broad Street and Cecil B. Moore Avenue in North Philadelphia at 11 a.m. this morning to take the wraps off what may be the most useful and attractive piece of street furniture ever to grace Philadelphia’s streets. That would be the new bus shelters that Intersection, an “urban experience” firm formed by the merger of urban technology design firm Control Group and the Titan advertising company, will install and maintain at more than 600 bus stops across the city. 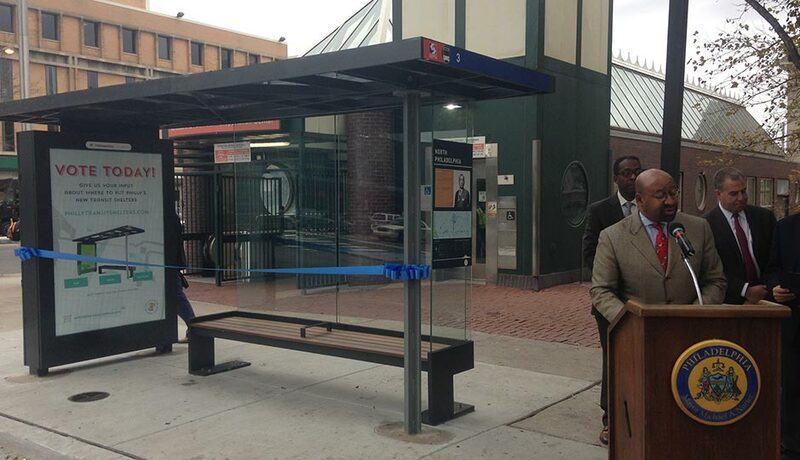 Designed by local architectural firm Digsau, the new shelters will offer increased comfort and information for passengers waiting for SEPTA buses. The wheelchair-accessible shelters will feature wood-slat benches, route maps and neighborhood information, and a sleek, stylish design that incorporates backlit or digital advertising displays. The glass roof allows sunlight to penetrate by day while providing a measure of protection against heat in the summer and a degree of solar-powered warmth in the winter, and a thin LED light strip along the back wall provides lighting at night in addition to the light provided by the advertising display. Intersection President Scott Goldsmith and Digsau architects Jules Dingle and George Murphy were also on hand for the ceremony. “A big part of what we were doing was to create a place that’s like a little park pavilion,” said Dingle. Dingle explained that the shelters are designed to withstand abuse. The wood slats on the benches are of a durable variety intended to last 15 to 20 years. The glass walls of the shelter are protected by a coating that makes graffiti easy to remove and is resistant to etching. And since Intersection employees will perform maintenance on the shelters on a weekly basis, they should continue to look good for their entire design life. The city has already identified some possible locations for new shelters based on a list of criteria that includes ridership, proximity to places like hospitals, shopping centers and senior centers, and requests from residents and elected officials. 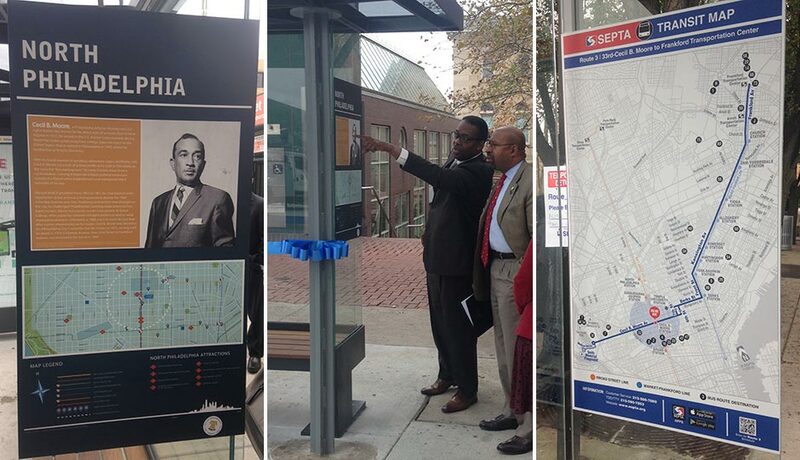 The Philadelphia Transit Shelter Project wants your input on where the new shelters should go too; you can vote on the city’s recommendations and add recommendations of your own at the project website.